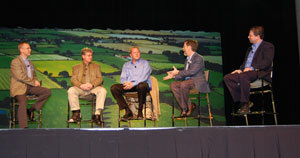 Biofuels industry experts discussed new feedstocks today in the final general session of the 2008 National Biodiesel Conference and Expo in Orlando, Fla.
Alan Weber, economic consultant to National Biodiesel Board, led a forum with Dr. Jack Brown from the University of Idaho (who is Scottish so he brings a European perspective to the biodiesel feedstock business), Keith Bruinsma, Vice President of Corporate Development for ethanol producer VersaSun (which is not far from biodiesel as you’ll hear in the clip), John Sheehan, Vice President of Strategy and Sustainability for Live Fuels (which is developing algae-based biodiesel), and John Soper, Senior Research Director for Soybean Product Development for Pioneer International (bringing the seed developer’s perspective to the conversation). It was a fascinating discussion with one of the most interesting aspects being how all of the panelists, although having varied perspectives and interests that would seem to be contrary to each other, really came together in their evaluation of the need for additional feedstocks. Some had the perspective that non-traditional feedstocks such as rapeseed should be used. Some looked to algae with its potential to produce thousands of gallons of oil per acre. Others saw the development of higher-oil-yielding, new strains of soybeans and corn to meet the demand. What struck me was how each panelist saw the worth in developing ALL of these ideas… not just one magic bullet to face the feedstock issue. See 2008 National Biodiesel Conference Flicker Photo album here.